Score and parts are available separately. 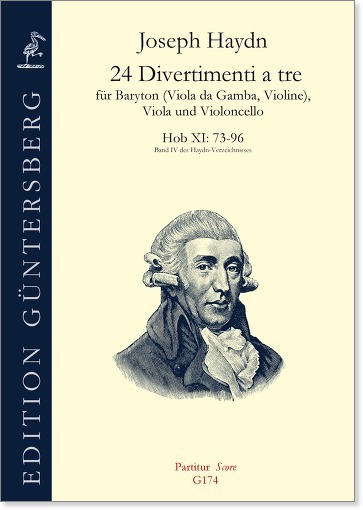 For his employer, Prince Esterházy, Joseph Haydn wrote 126 divertimenti à tre for baryton, viola, and violoncello, which are known by the designation “baryton trios.” Our present edition includes the twenty-four divertimenti no. 73–96. Since the baryton part can be played on viola da gamba – in doing so, the few notes intended to be plucked can be bowed – we have included a part in alto clef. In the original, the baryton parts are in treble clef, but there is evidence that already in Haydn’s time they were also played an octave higher on the violin. The source for our edition is the copy made by Haydn’s personal copyist Joseph Elssler Sr., which is housed in the National Library in Budapest. We have largely dispensed with editorial additions and corrections. – We believe that our edition will help free this beautiful music from the obscurity into which it has fallen not least because of being specified for the rare baryton. 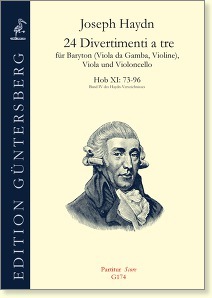 See also Haydn, 28 Divertimenti a tre, G179-G183.